This Chinese zodiac design is simply precious for a baby or even younger kids. The 12 animals that represent the zodiac signs are hand drawn in a sweet style with beautiful colors. The animals are scattered on a background that is recolor-able. We have chosen to use soft cream colors, that are gender neutral, however they can be easily changed to any pastel or in fact to any other color - we have 100s of colors to choose from. 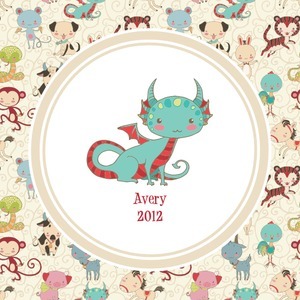 .We chose a round label with the child's name and year of birth for personalization in red and then paired it with the matching sign zodiac sign - which in this case is the dragon. To figure out your zodiac animal, see image with dates, characteristics and compatible sign. To convert from the Gregorian calendar to the Chinese calendar click here.